of the year and of the season in which we are born. Astrology does not lay claim to anything else." Astrograms have been marketed wholesale through catalogs such as Personal Creations/ Spiegel editions. It was the volume of these sales and the way the orders came printed out on computer forms that showed us where we wanted to be by the twenty-first century; on a network, not doing any manual processing or printing. 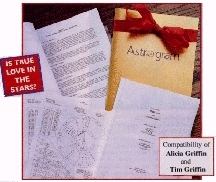 When the exponential renaissance of astrology, real astrology, not sun sign astrology came to the web in the late nineties, we realized we were no longer able to compete with the big internet sites unless our reports were on line via our chart service positioned and priced to compete with their massive volume discounted rates. Thus Astrogram shut its doors and astrogram.com was born. An electronic pioneer, Astrogram has been written about in two books addressing cyberspace commerce. Astrogram's Kiddygram and Astrogram were profiled and highlighted in Jaclyn Easton's trend spotting book, Shopping on the Internet and Beyond!. "Of the electronic storefront's that I visited, about 20 percent made the cut. Out of that 1,000 I chose the cyber-retailers I thought were the most outstanding--these are the ones that are fully profiled in each chapter." Here's what she said about our reports: "Outstanding astrological reports. Choose from natal chart interpretations to day-to-day forecasts--a zillion times more accurate and detailed than anything you'll find in your daily newspaper--all from the company considered one of the best in the business." Although this book is now out of print, Jaclyn Easton is still one of the major fixed stars in the changing constellations of writers able to keep abreast of trends on the web. Her last two books were Striking It Rich (with introduction by Amazon.com CEO Jeff Bezos) and Go Wireless. Astrogram was also featured and interviewed in Daniel S. Janal's, 101 Successful Businesses You Can Start on the Internet. "Birthdays are our business. We provide astrological chart reports based on a customer's precise birth data (date, year, exact time and place of birth) Since 1986 we've provided an unusual service that lends itself to being featured on the World Wide Web. Our goal is to be marketing in cyberspace as we move into our second decade. However, our first reason to be on the Web is to position our reports as an upscale, elegant and affordable introduction to the ancient art of astrology and a great source for beautiful birthday gifts! Our second goal was to print less of our glossy brochures and save a few trees. Our ultimate goal was to be able to provide our reports online in real time 24/7 via our on-line chart service. For fans of the elegant Astrogram gift report we still provide them via our virtual secretary Mademoiselle Kiddie, who will take your order via email and invoice you via Paypal. You will be able to pay using your credit card. All orders are shipped priority mail."